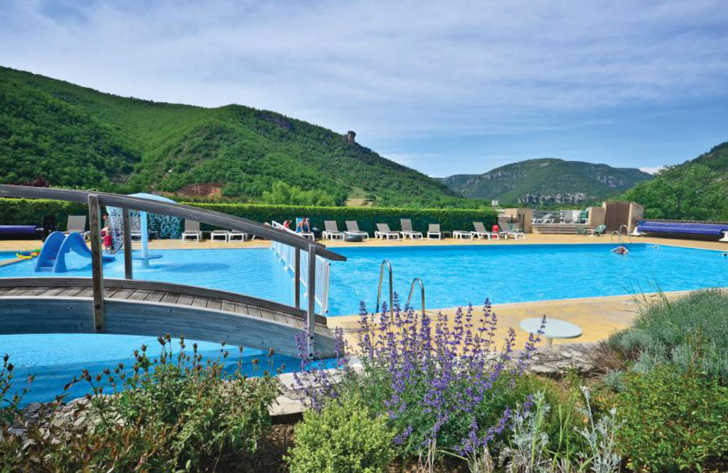 Val de Cantobre is a 4 star campsite located in Nant in the Ardeche region of France. Val de Cantobre is a small campsite which packs a massive punch when it comes to location, scenery and quality of facilities and activities. 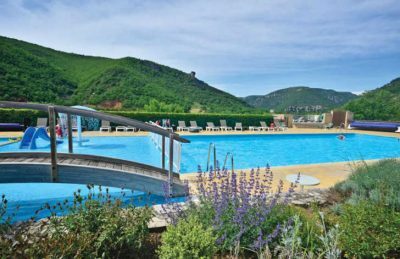 Located in a beautiful setting Val de Cantobre can be found between the Cevennes national park and the Tarn Gorges in the Dourbie Valley and is very fortunate to benefit from some truly wonderful views of the surrounding hills. The terraced campsite also benefits from some wonderful views towards the cliff top village of Cantobre. Val de Cantobre is a great choice of campsite for those wanting to relax on site but it’s also perfect for those who wish to get out and explore the local area. Whether you decide to go for a stroll or hike in the mountains, hire a bike and go for a cycle in the national park or go a little further a field in your car, we’re sure that you’ll have a spectacular holiday whilst staying at Val de Cantobre campsite. Although Val de Cantobre is a small campsite the range and quality of facilities and activities are excellent. There are plenty of sports activities such as table tennis, football and volleyball as well as a cinema and a great pool complex which means that you’re sure to find something to keep you happy. One of the best things about Val de Cantobre is its swimming pool complex. There are 4 swimming pools in total, two for the whole family and two further pools for children. If that’s not enough to tempt you, you’ll also find a wild river, waterslides and a mushroom fountain for little ones. Finally for those that prefer to relax in the sun whilst the kids swim, you’ll simply love the great sun terrace with wonderful picturesque views over the mountains. Val de Cantobre campsite offers a comprehensive selection of activities and facilities on site and also nearby to ensure you have a fantastic family holiday. On-site activities at Val de Cantobre campsite include table tennis, football, basketball, volleyball, boules, mini golf, playground and cycle hire. Facilities available at Val de Cantobre campsite include WIFI, restaurant, snack bar, takeaway, bar, groceries, games room, animation team, washers and dryers. Accommodation at Val de Cantobre campsite includes a range of 2 and 3 bedroom mobile homes and tents that are available from Eurocamp.